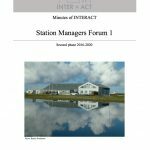 The INTERACT Station Managers’ Forum meeting I was hosted by the Sudurnes Science and Learning Centre in Iceland on 25-26 January 2017. The meeting was held in conjunction with the Kick-off meeting marking the onset of the second phase of INTERACT. The network has grown from 33 partner stations in 2011 to 79 participating stations distributed across the ArcticDefinitions of the Arctic vary according to environmental, geographical, political, cultural and scientific perspectives. Some scientists define the Arctic as areas having a high latitude, long winters, short, cool summers,... More and northern cold regions. The SMF meeting was used to present tasks embedded in the work package and discuss how to accomplish these. Agenda, minutes and presentations (numbers refer to agenda item) can be found here.